Piano Man is such a satisfying album in part because it’s so obviously a full-hearted, emotionally-draining effort. That makes it less surprising — though no less disappointing — that Streetlife Serenade sounds exhausted and depleted. Streetlife Serenade crystallizes the faint western hints on Piano Man and ends up with a loose concept album about life on the west coast. But where Elton John’s western album told tales of cowboys and guns and saloons, Joel chronicles the modern frontier: 9-to-5 work life and Los Angeles indulgence and suburban routine. It’s as unromantic as it sounds. Joel headlines the album with two ill-conceived attempts at profound social observation. The title track (rather, the almost-title track Streetlife Serenader) outlines the theme of everyday encounters that the rest of the album would largely follow. It strives too hard to be profound and fails to redeem itself with a memorable tune. The second of these is Los Angelenos at least provides a strong melodic background. But it stumbles just as hard as Streetlife Serenader in its attempts at incisive observation. Perhaps a more precise, explicit chronicle of aimless indulgence could have worked along the lines of Captain Jack. The next track, Great Suburban Showdown, captures a hazy warmth and succeeds slightly more than the opening tracks at chronicling a way of life. It also seems to be a thinly veiled dismissal of his roots on the east coast – “I’m gone with the wind and I won’t be seen again.” It’s a bit ironic then that his homecoming would provide a creative spark two years later. In all, the opening three tracks feel like a misfire. They foreshadow Joel’s continual failure to be a social critic. Joel’s poetry works best when it’s about himself and/or Long Island. Any broader than that and he runs into trouble. Fortunately, the later tracks redeem the package from being a complete disaster. After a brief instrumental detour (more on instrumentals later), Joel unleashes five straight compelling tracks. The best of these is The Entertainer, a song that succeeds on a few levels. First, it serves a nice complement to Everybody Loves You Now, with Joel now the one “at the center of the stage.” And how does he find it? Just as ungratifying and lonely as he projected. The Entertainer is a brilliant trashing of the music industry: himself, the labels, even the fans. Particularly memorable is the verse where he reflects on Piano Man’s title track: “It was a beautiful song / But it ran too long / If you’re gonna have a hit / You gotta make it quick / So they cut it down to 3:05.” It recalls the frustrating release of the Piano Man single, summarized here. The Entertainer is also the most sonically panoramic track Joel had yet recorded. It showcases Joel’s first prominent use of an electric keyboard and features a number of different instruments jamming in the background of each verse. 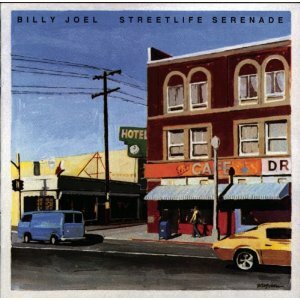 Its strong melody paired with compelling lyrics and sonic expansion make it the jewel of Streetlife Serenade and one of the better tracks of Joel’s early career. Another strong track on the album is Roberta, the fifth track on the album. It covers a narrative that’s almost a cliche at this point — falling in love with a prostitute or a stripper — but does so with grace and one great line after another. It’s one of Joel’s few tracks where the lyrics are much more compelling than the song itself. A few tracks later, Joel really nails the western vibe for the first time in a pair of songs, Last of the Big Time Spenders and Weekend Song. The former is a pretty generic love song and covers a well-trod Joel theme: I’m not rich or fancy, but I can give you my time, music, and love. The latter, though, is a great example of why it’s worthwhile to go through each of Billy Joel’s albums, not just greatest hits discs. I don’t want to overstate Weekend Song’s greatness, but it’s a track that should have been a single. The song blends a honky-tonk melody and earnest lyrics to a strong effect. To close out the excellent five-song stretch is the shortest track Joel ever recorded, Souvenir, which clocks in at 1:59. It has a spectacular finality to it: “Every year’s a souvenir that slowly fades away.” In many ways it captures Joel’s struggle for significance that’s defined much of his career. For years, he closed every concert with this song, and I can’t think of a more fitting finale. Souvenir would have been a perfect album capper, but Joel goes ahead and ruins the close of the album with the inclusion of another instrumental. Here’s my issue with the instrumentals: They’re just taking up space that would have been better used by full songs. The more defensible of the two instrumentals is Root Beer Rag which seems to echo the ragtime stereotypically played in old west saloons. It matches the western feel of the album. But The Mexican Connection, which closes the album, really makes it sound like Joel just ran out of time to write lyrics. It detracts from an impressive closing stretch on the album and leaves you with a bad taste in your mouth. In all, it just feels like there’s less music and fewer ideas on this album than Piano Man — subtract the instrumentals, and you’re left with eight short tracks, one of which runs less than two minutes. And the overall quality of the songs is a grade below the songs on Piano Man in spite of a few gems. Fortunately, the peak of his career was just on the horizon, and Streetlife Serenade ends up an inconsistent oddity, barely a blip on the radar, rather than a harbinger.